(WXYZ) – Gov. Rick Snyder and his team are considering many options to get construction across the state back up and running, including activating the National Guard, as the work stoppage due to a labor dispute approaches week three. In a statement, the governor’s office said they are looking at several options to finish projects as quickly as possible. 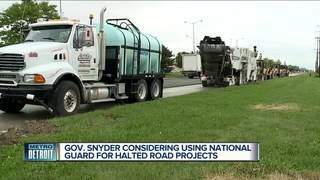 “These options range from withholding payments for contractors to activating the National Guard and using their heavy equipment operators for roadwork,” Ari Adler, a spokesman for Snyder, said.